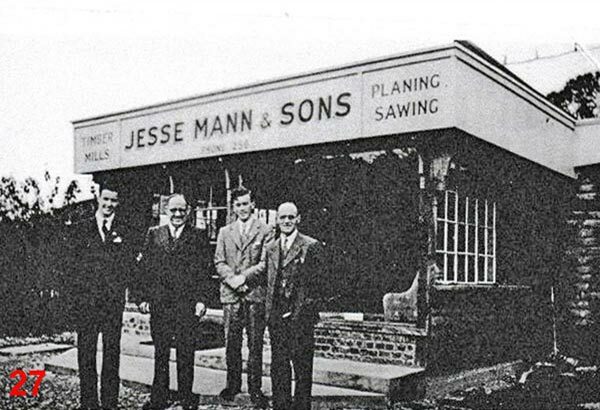 Most people local to the Haslemere and surrounding areas will know that our Haslemere branch (which we acquired in 1997) has a long interesting history and had previously been Jesse Mann & Sons (timber merchant). Indeed some may even still refer to it by that name today! We are aware that over the years locals have shown interest in the history of the site and a few have sent us their recollections. 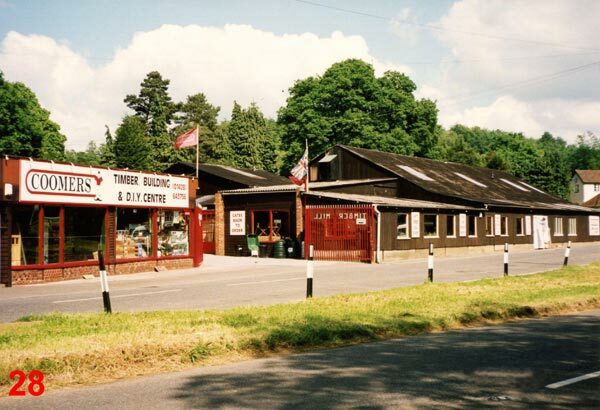 We also find the history fascinating, so have put together this account of memories and photos from family, ex-employees and locals who remember the business fondly. We sincerely thank all who have contributed. 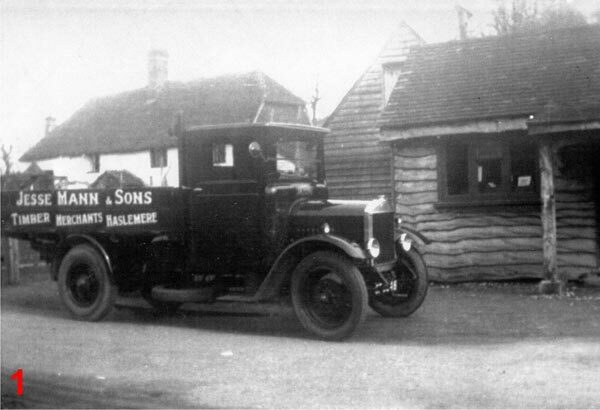 Old Jesse Mann truck seen here outside what is now our Haslemere branch. Set back to the left of the shop, as it still is today, was the old Jesse Mann stable, which we once used as an office but it now forms part of our shop. 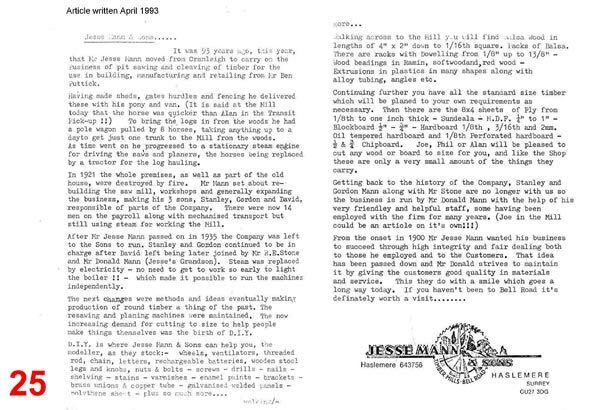 David Mann (grandson of Jesse Mann junior, and whose father was the second youngest of 9 children) with input from Trevor Hill (referred to later below) and Donald Mann's wife Joy, kindly supplied the following background information. Jesse Mann junior, was born in Cranleigh, Surrey in 1868. 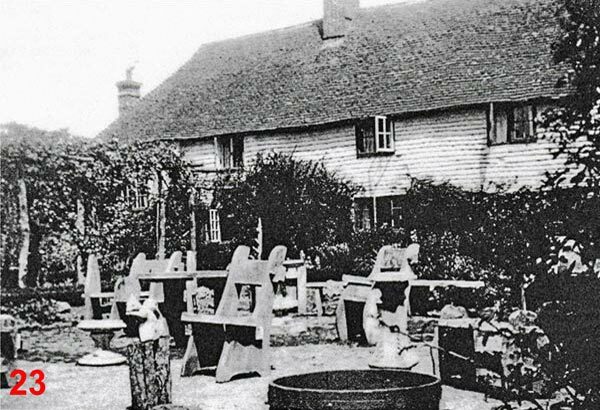 He was the son of Jesse Mann, a steam-driven timber mill owner in Cranleigh. 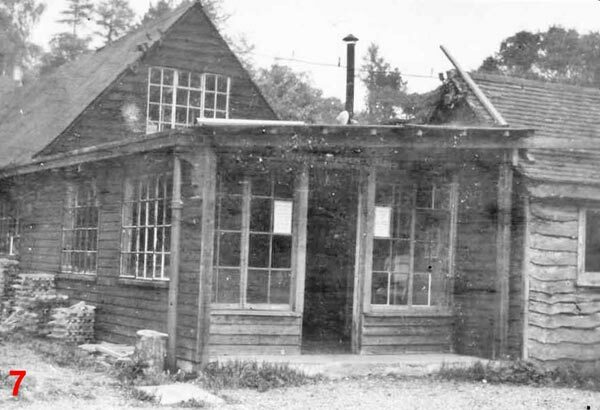 Jesse junior moved to Bell Road Haslemere in 1902 (after the birth of his sixth child) and took over an existing timber merchant's property on what was then known as Carpenters Heath. 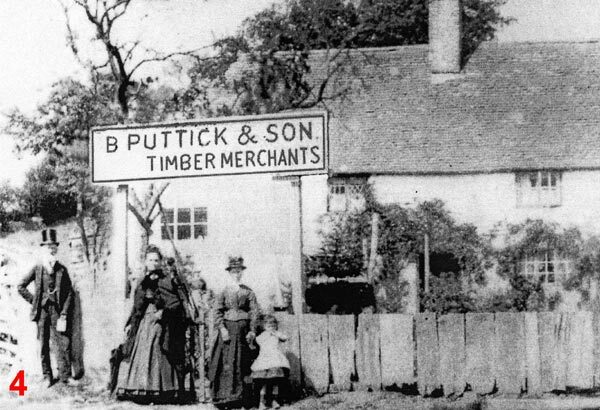 The premises had previously been occupied by Benjamin Puttick - an ancestor of Trevor Hill. According to census returns, Benjamin had moved from Fernhurst to live at the house on the land known as Fleur-de-Lys, between 1861 and 1901. The only property on the land at the time when Jesse Mann junior moved to Haslemere was Fleur-de-Lys which became the family home. This had originally been a pub and Jesse found evidence of that by way of beer bottles etc up the chimney when he moved in! Jesse built the original saw mill to the south of Fleur-de-Lys. The band saws in the mill were driven by belts and the power supplied by a large steam engine. Stables for the horses - used to draw the logs to the mill - were built to the right of Fleur-de-Lys and the end of the stables building can be seen in photo 1. 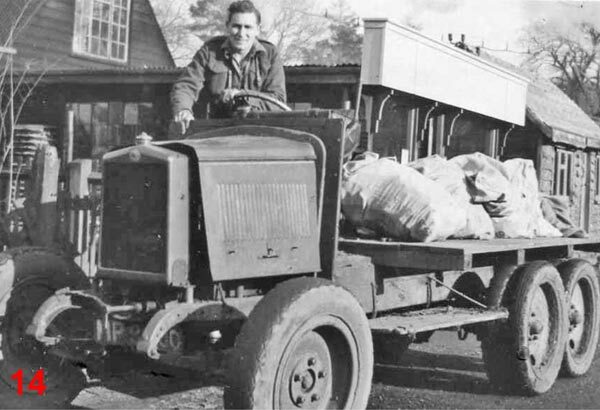 The roof of the stables was used as a hay loft and the door to haul up the hay can also be seen behind the lorry in photo 1. Billy Hill had the job of looking after the horses. It could take anything up to a day to just get one trunk from the woods to the mill, using a pole wagon pulled by 8 horses! 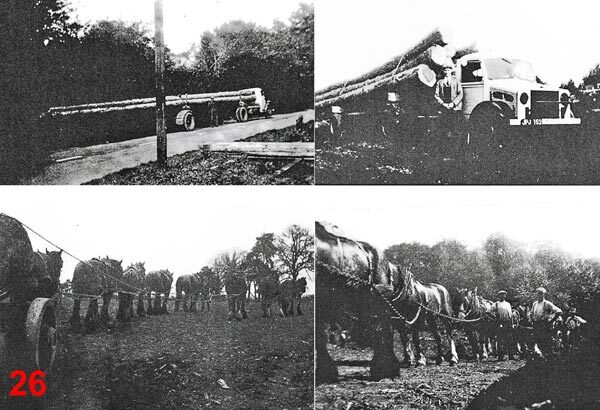 As time went on the horses were replaced by a tractor for the log hauling. Jesse delivered the sheds, gates, hurdles and fencing that he'd made with his pony and van. 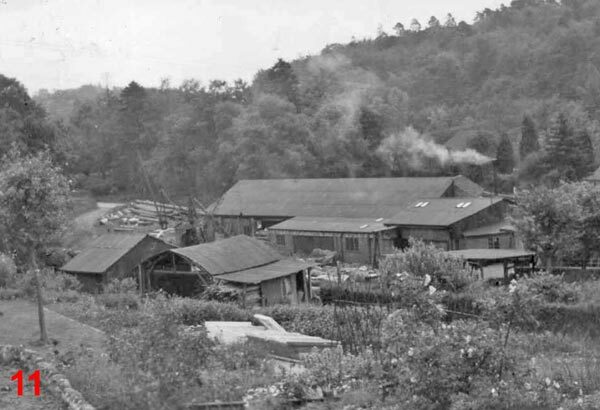 The original saw mill was destroyed by fire in 1922. Arson was suspected since the mill caught fire at several places simultaneously. Jesse Mann rebuilt the mill, this time to the right of the stable block and this was the position of the building up to the time it was sold. The steam engine survived the fire and was moved to the new mill where it was again used to drive the band saws. Charlie Smallbone’s job was to keep the steam engine going by burning wood offcuts and sawdust, and to sharpen the band saws. He had a long room at the side of the mill where he used to lay out the band saws for sharpening. At that time timber trunks were stacked in large pyramids on the land at the back of the mill and weathered for up to 9 years before being brought into the mill for cutting. As Jesse Mann's children grew up, he built two houses at the top of his land for his two eldest sons, Stanley and Gordon. Stanley's was called Cranley which was the original spelling of Cranleigh, Jesse's birthplace. He built a third house at the north end of his land for Reg Stone (who was related to Jesse) to live in. Members of the Mann family have very fond childhood memories of the mill. David Mann recalls visiting during school holidays and staying with his Aunt and Uncle (Rosemary & Gordon Mann). His Auntie Mim - the youngest of Jesse junior's 9 children - taught him to drive by allowing him to try out her car in the driveways around the mill, and told him how she helped her father harness the horses in those early days when he used them to bring timber in from the local area to the mill. Whilst Audrey Harris (the younger daughter of Gordon Mann) recalls that it was the playground of her childhood, and the time she had a narrow escape when she’d hidden in the saw pit and they started up the saw! Audrey also remembers the mill building was used for wartime practice. After Jesse died in 1935, Stanley Mann became the senior partner and was responsible for buying and selling timber products, and with his brother Gordon ran the mill and worked on the large band saw (the saw that initially cut up the timber trunks). Finally, Donald Mann (son of Stanley) inherited the mill and ran it until his retirement. 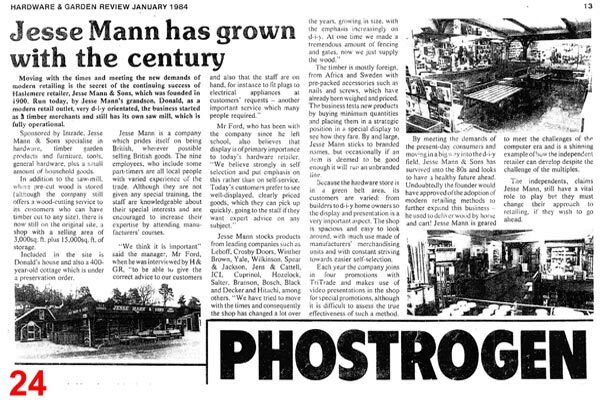 In the 1980s - during Donald’s reign - Jesse Mann & Sons branched out into the sale of DIY products to meet the demands of the present-day consumer (see photo 24 for the full article). I remember meeting Jesse Mann himself, a rather short old man, soon after my father became Vicar of Lynchmere. Ever since then our family has been coming in to the mill for bits of timber. The steam engine was just opposite the shop. It seemed to work continuously turning the belts that turned the overhead shafts and belts that worked the numerous saws of all different varieties; it was powered by all the shavings and saw dust that was collected from the floor. To a boy it was most exciting to see all the belts going round, with the saws worked by various friends (in photo 2), particularly Charlie Smallbone and his brothers. They were always most kind in cutting wood to our requirements, not forgetting the time when it snowed heavily and we needed runners for two sledges made from three enamelled metal plates advertising 'Shell' and 'Pratt’s Bonio', that my father removed from the old Shotter Mill, then owned by the Oliver family. (They are now in rather poor shape but still at the bottom of Lynchmere churchyard). I went to Oxford after WWII to study Geography. An essential part of the course was that we were required to write a 'Geographical Description of an Area'. I chose the region of Midhurst and Haslemere. This involved getting to know about agriculture, commerce, communications, history and geology of the region. I visited farms and businesses including Jesse Mann & Sons. It was at that time owned and managed by Stanley Mann. He very kindly gave me an hour of his time that resulted in the following report in my thesis. 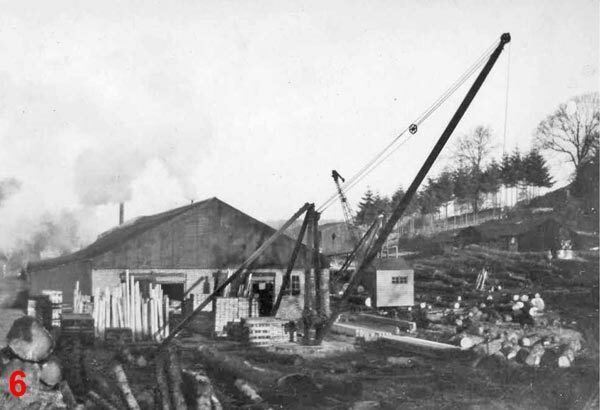 “There are five sawmills in the region, the largest of which is Jesse Mann & Sons in Camlesdale. When it commenced working in 1900 until 1925, all the wood sawed was within a six mile radius. After 1925 the radius was extended to twelve miles, but is now again decreasing. To keep the mill working at full capacity, however, wood is going to be imported from Germany. As an estimate of the decrease of timber, in 1927 40% of the wood cut was 'rubbish', but the percentage has now (1948) gone up to 60%. The output of this mill is up to 3,000 cubic feet of sawn timber a month”. 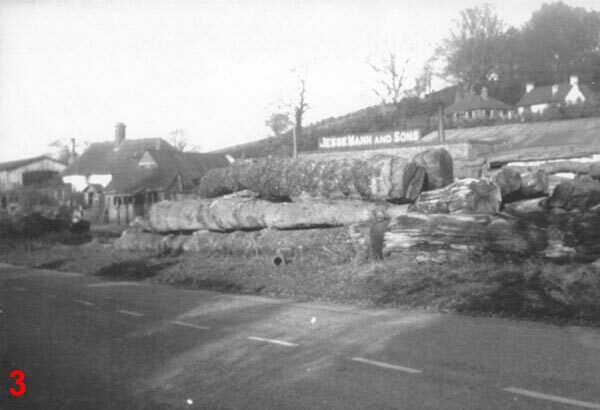 Timber laid out on the grass verge on Bell Road, Haslemere, with the mill behind. 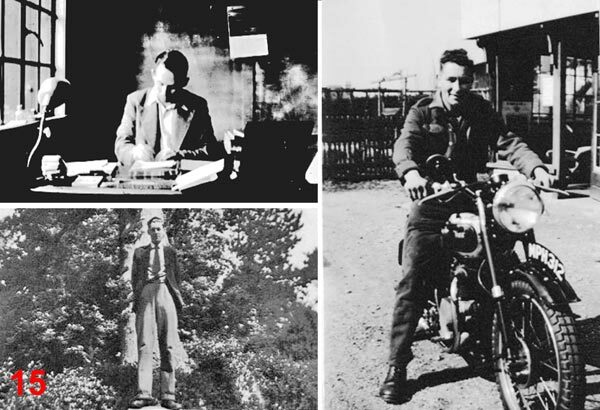 In 2019 we were delighted to make contact with historian Dr Trevor Hill who’d worked at Jesse Mann & Sons between 1947-1949, and also a relative of Benjamin Puttick and Stanley Mann. 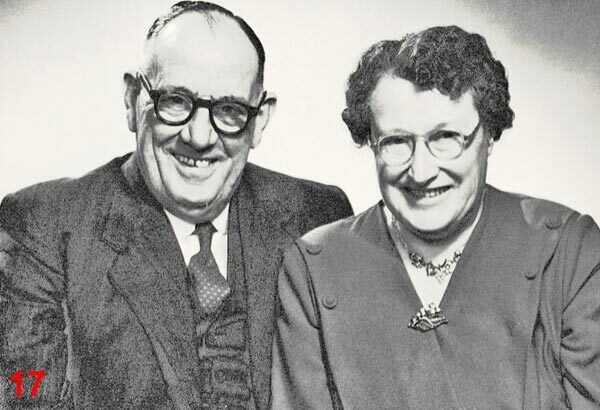 His great grandfather, William Stacey, was a lodger in Fleur-de-Lys in 1871 and later married Ellen Puttick, one of the daughters of Benjamin Puttick - the previous owner before Jesse Mann junior. It was a coincidence to discover that Trevor had actually been the photographer of photo 2 which we’d found on our premises, and which we’d tasked ex-employees Doug & Joe Smallbone to name the staff in some 9 years earlier! Here we share some of Trevor’s recollections. I was born in Haslemere in 1931. My mother's parents lived at 66 High Street, Haslemere. Their name was Stacey and the Stacey family originally came from Fernhurst. My great grandfather, William Stacey, was a lodger in Fleur-de-Lys in 1871 and later married Ellen Puttick, one of the daughters of Benjamin Puttick. Their son, William James Stacey (my grandfather) was born in Fleur-de-Lys. 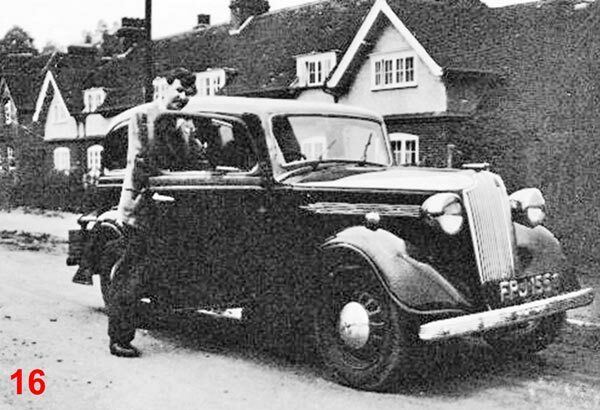 In 1936 my parents moved from Eastbourne back to Haslemere with me. 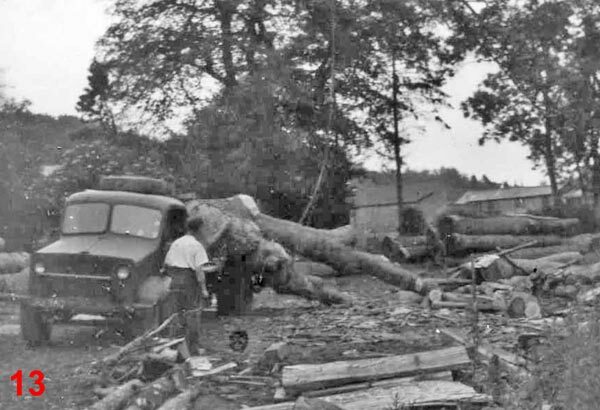 My father was to work in the carpenter's shop for his brother-in-law, Mr Stanley Mann at Jesse Mann & Sons, Timber Mill, Bell Road, Haslemere. 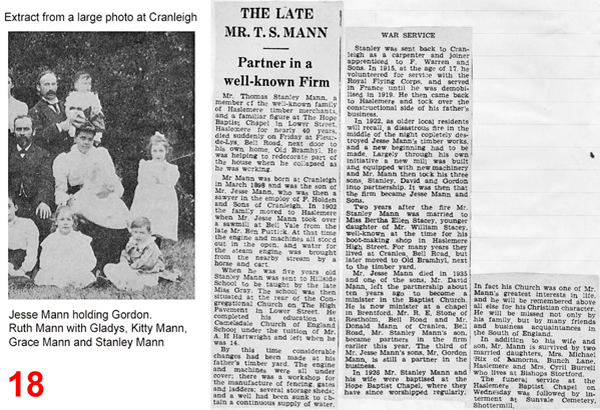 For a few months we lodged with Mr Mann's other brother, David Mann, who lived in Camelsdale. 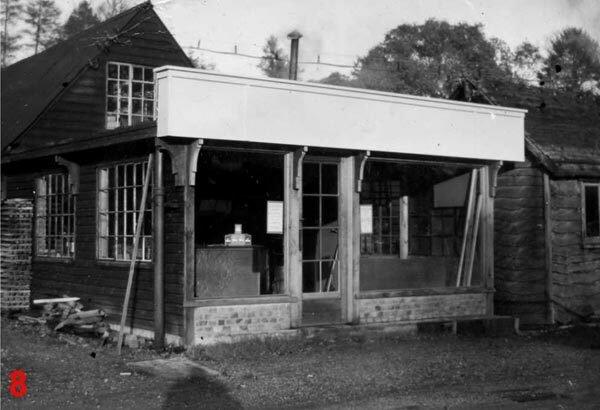 My parents then moved to a flat in St Christoper’s Road, and by the end of 1939 had moved to live in Frensham where my father, a grocer, became the owner of Frensham Stores. However, at that time I was staying with Uncle Stanley Mann, Auntie Birdie and my three cousins at Cran-Lea on the hill above the timber mill. I spent many of my summer holidays during the war staying with my cousins at Cran-Lea, so I became very familiar with the area around Camelsdale including Marley Common where we discovered a crashed German Bomber, and Kingsley Green where the Mills family lived, who were relatives of the Mann family. I can remember family picnics and games in the woods on Marley Common. In 1947 after I left school, I was employed as the Junior Clerk in the office of Jesse Mann & Sons. The timber mill was run by my uncle Stan and his brother Gordon. The Labour government had just introduced the Welfare State that included National Health Insurance, and contributions from each employee were deducted each week from their wage packets plus a contribution from the employer that was calculated by Jim Clapshaw, the firm's accountant. These funds were used to purchase special insurance stamps from a Post Office and also most of the employees joined the Savings Scheme that took an amount from their wages each week. One of my tasks was to go to Mr Roebuck who ran Camelsdale Post Office, buy the required number of stamps and stick them on the employees cards. If an employee was off sick, no stamp was purchased for that week as they would have been drawing sick pay from the government. The money collected for the Savings Scheme was used to purchase Savings Certificates which were a higher value than each person's weekly contribution. To allocate the certificates fairly, all the contributors names were put in a hat and I used to meet with the men when they were having a tea break and they would pull the names out for those who that week were to receive a certificate. 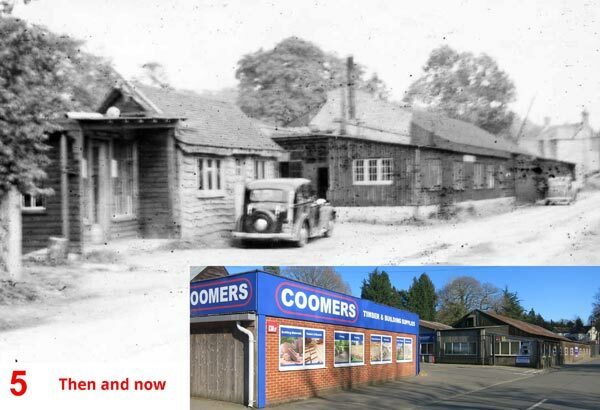 I left my employment at the timber mill in 1949 and much later in life became a historian. In 2018, having discovered how to access the National Register online, I used it to obtain details for both my family and local history research. Having just completed a historical study of Cressage [Shrewsbury], I have now turned to look at other places to keep my brain active at 87. 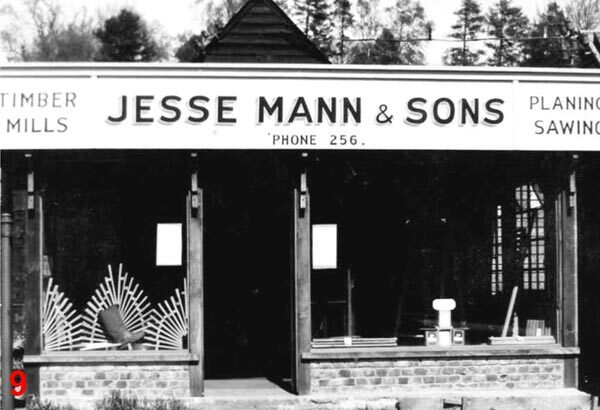 Looking back to my days at Jesse Mann & Sons, I turned out some photographs of Jesse Mann & Sons that included one I had taken of the employees, and looking at it I began to wonder where they all lived. It appears that Jesse Mann junior, like his father in Cranleigh, had introduced a steam engine to power the mill he built. It was fuelled by scrap wood and sawdust. In 1939 the steam engine was stoked by Fred Howkins but when I worked in the office from 1947 to 1949 the engine driver was Ted Smallbone, who I believe to be the brother of Charles Smallbone (the saw doctor at the mill when I worked there). Charlie maintained and sharpened all the circular and other saws in use. The engine was connected mainly by an overhead belt system to the various saw benches, planers etc in the main building. 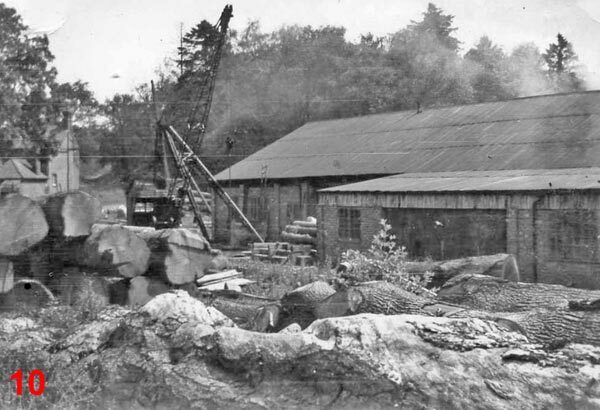 However, electricity had been introduced during the 1939/45 war to power a new crane that was used to unload tree trunks and load them into the mill. Also some electric saw benches were in places other than the main mill building, and one was next to the office where customers would collect timber cut to their requirements. 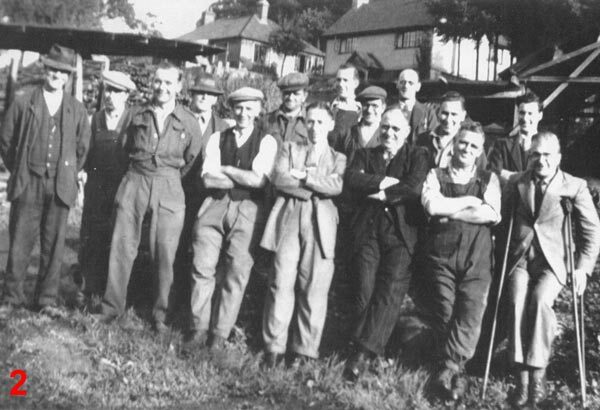 Reg Stone (on crutches in photo 2) was a Methodist local preacher who ran a very lively Youth Fellowship at Haslemere Methodist Church - at age 16-17 I was a member of it. The office was situated next to Jesse's old home Fleur-de-Lys and his widow and one of his daughters still lived there. Beyond the house was a roadway that led into the yard and also gave access to the house Cran-Lea and Scots View as well as Restholm, where Reg Stone, the firm's secretary, lived. 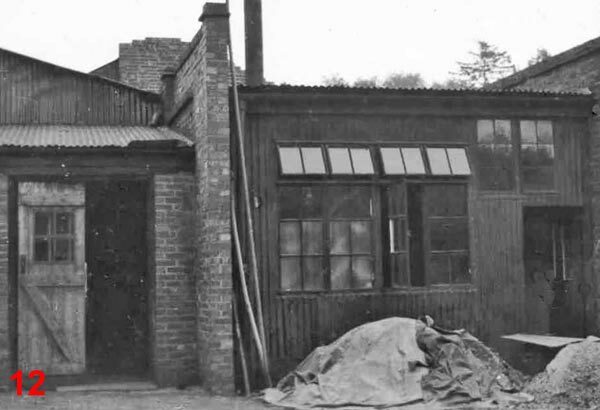 In this yard there were workshops and garages for maintenance of vehicles, the carpenter's shop and a very large airy storage building where processed timber was stored in a way to dry it out before despatch to large customers. For example, when I worked at the mill, British Rail was a customer that had contracts for supplies for their carriage and wagon works. This was how I learnt to type on an upright Underwood typewriter for the long quotations and schedules for the orders! During my employment, the firm bought a spirit duplicator that meant we could print in colour. I found its use interesting, rather primitive now but the latest technology at the time!! I also handled the incoming telephone calls and mastered how to put calls through to the right person. The front office was where I handled the customer orders and I seem to remember that, because of post-war shortages, local persons had to complete a form of some sort; so I saw such forms signed by Stewart Grainger the film star and Freddy Grisewood who was on the BBC! We are very grateful to all the contributors above for taking the time to share their recollections and photos. In particular to Trevor Hill for the many photos he kindly shared with us. 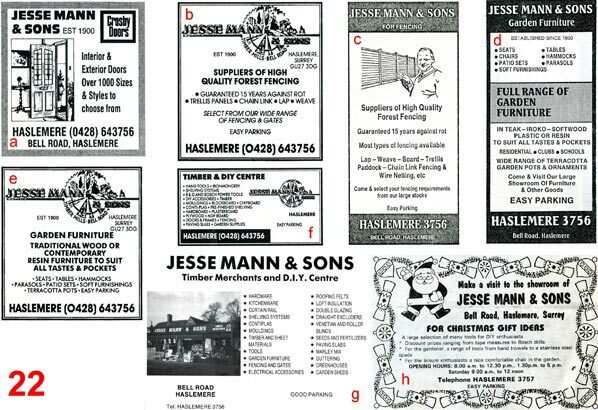 We hope you enjoyed reading these accounts and are sure many other locals have fond memories of Jesse Mann & Sons. If you should have old photos of the premises that you’d be happy for us to share, please feel free to get in touch via the 'Contact us' form here on our website. Top Left: Cran-Lea (originally “Cranley”) and Scotts View, 1948. Below: Cran-Lea, 1948. From our archives. This MI Mortiser was purchased secondhand by Jesse Mann circa 1923. It had been purchased new by Messrs Warren & Killick, Cranleigh, in 1911. 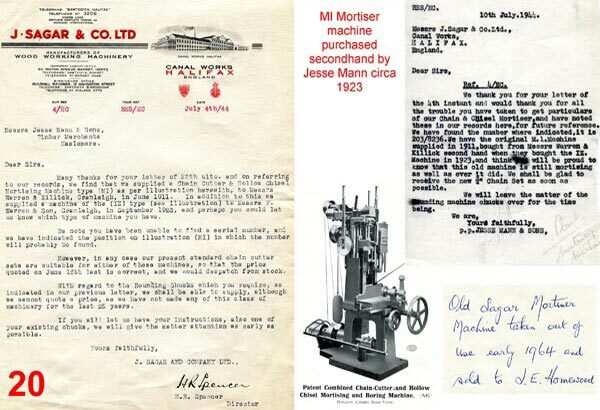 A handwritten note amongst the paperwork confirms the machine was sold in 1964 to JE Homewood. In 2016 we shared these images on our social media and JE Homewood responded to say they remembered the machine and they’d since passed it on to a local woodsman and (at the time) believed it to still be in his possession …. making it well over 100 years old! 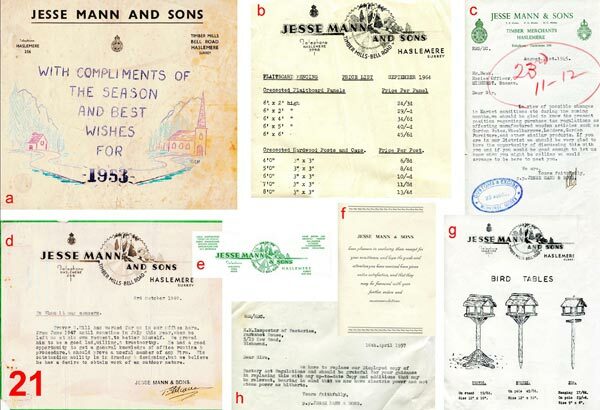 A selection of Jesse Mann paperwork from our archives (excepting items a & d, kindly provided by Trevor G Hill). a) Christmas greetings from Jesse Mann, 1953. b) Fencing price list, Sep 1964. c) Letter to Tax Excise Officer at Midhurst, Aug 1945. d) A reference letter for Trevor Hill, confirming that he’d worked in the office from 1947-1949. e) A more modern style of Jesse Mann headed paper, it’s uncertain when it dates back to but we know it was in use in 1995. f) Receipt for remittance card. g) Bird table prices, date unknown but it was attached to other documents dated 1966. h) Letter to HM Inspector of Factories, Apr 1957, which is interesting as it mentions the transition from steam to electric power. A selection of adverts from more modern times, but all date back to before we acquired the premises in 1997! a) Doors advert in Yellow Pages, 1993. b) Fencing advert in Yellow Pages, 1993. c) Fencing advert in Yellow Pages, 1988. d) Garden furniture advert in Yellow Pages, 1990. e) Garden furniture advert in Yellow pages, 1993. f) General advert in Yellow Pages, 1993. g) Waverley Borough Guide advert, undated. h) Herald Christmas feature advert, 1989. Our Haslemere branch in 1998 (a year after we acquired it). For larger images of all the above photos, download a PDF file here. 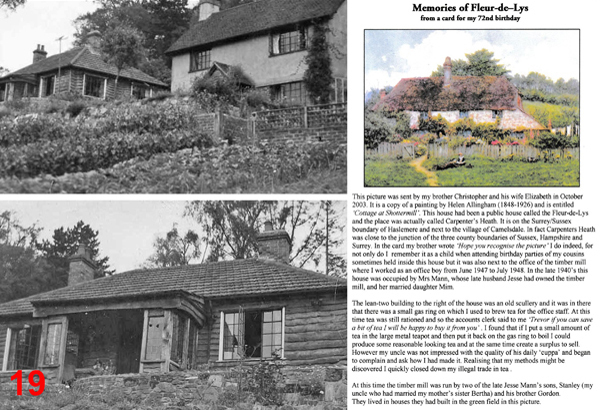 Those interested in Jesse Mann & Sons will also find reference to Jesse Mann history in the book "Around Haslemere & Hindhead from old Photographs."